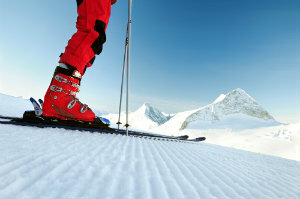 Properly Fitting Ski Boots to Prevent Injury | Podiatry Associates, P.C. Few things compare to the rush and fun of downhill skiing in the mountains. The snow flies behind you as you race down the slopes, carving your way around and through powder drifts. It’s a popular sport for a good reason. It can also be fairly dangerous, though, which is why fitting equipment correctly is so important to help prevent foot and lower leg injuries. This is especially key for your ski boots. Ski boots are designed to hold your feet and ankles tightly in place to prevent them from moving incorrectly as you fly over the snow and down the slopes. Properly-fitted boots allow for tight ski control, and also help prevent injuries to your feet and lower legs. Fitting these boots takes practice, and it’s best done with an expert who knows exactly what to look for in a good fit. Still, there are some things to know about fitting ski boots that can help you select a pair. When you try on new boots, wear the right kind of socks. Special ski socks are the best, since they add protection to areas that need it without being too thick. Socks that are two thick can actually put pressure on the tops of your feet and limit your circulation, making your toes colder. When you initially put your feet in new boots, they will feel tight. Don’t automatically dismiss them, even if your toes are brushing the ends at this point. Remember, the cushioning will form to your feet after just a few days’ skiing. However, you should never feel like your toes are crumpled in the end of your boot. Leave your boots unbuckled and lean forward to help pull your heel all the way back. If they are the right length, buckle them appropriately and make “skiing motions” to test the fit and comfort. Although you don’t wear ski boots as often as shoes, fitting them properly is no less important. It’s best to get help from experts. If you’re struggling with foot pain while you ski, even if your boots are the right fit, let us know at Podiatry Associates, P.C. We’ll help you take care of your lower limbs so you can enjoy your favorite activities all winter. Make an appointment at our Cherry Creek, Castle Pines, and Parker, CO, offices by calling (303) 805-5156. You can also use our online forms.